Let me show you how to sue a Halftone stamp if they are new to you. Stamp the base color - I used Archival olive, onto a #5 tag. Change out the stamp to the outline and stamp over the base image. You don't have to be perfect, in fact it's better if it's a little off, to show some white in the background. If you have never used stamps like these, just create a few extra tags so you can practice. 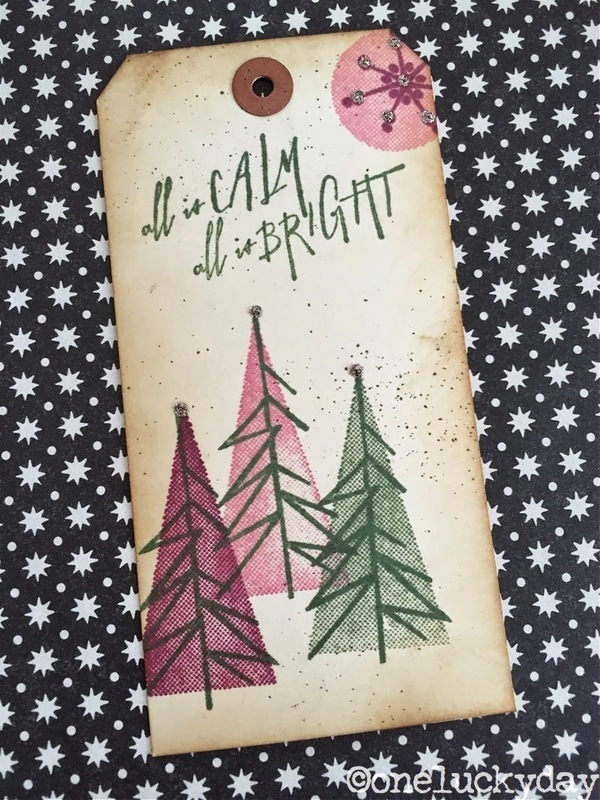 The friends that made these tags with me were novice stampers and had no problem once they practiced a few times. Next up, a sentiment. I found a one that fit on the #5 tag quite nicely from the Deco Christmas set. I used the starburst from the Halftone Christmas set to add a faux snowflakes. Then finished up by using Gathered Twigs on the edges and Stickles in Platinum (my favorite Stickles). I used the Stickles in a couple different areas. The tag on the left has it only on the starburst shapes. And the tag on the right has it on the buttons and the center of the starbursts. Even though it's hard to see here, I did think having it concentrated on the starbursts gave more of an overall impact. 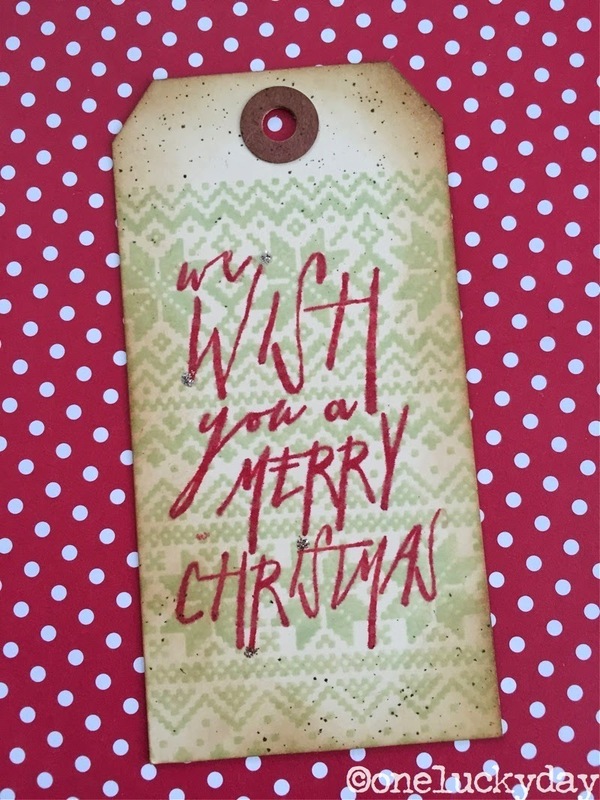 Next up is a modern take on a Christmas tag. This one is larger - #8 tag. 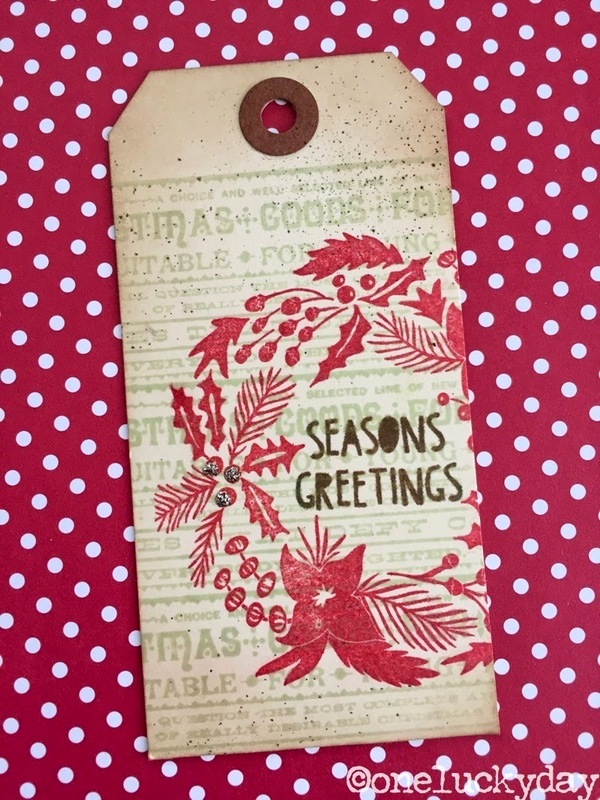 I used the same Halftone Christmas set as well as the Handwritten Holidays 2 set. I changed up the colors to Olive, Plum and Rose Madder, not your typical Holiday colors! I love the result though. I think using a Walnut Stain Distress Marker and the Distress Marker Spritzer to create the speckles is key. Really gave it a nighttime sky look (and to be honest, that DM Spritzer is always the funnest part of any project or card). This one is super simple but it is a favorite. 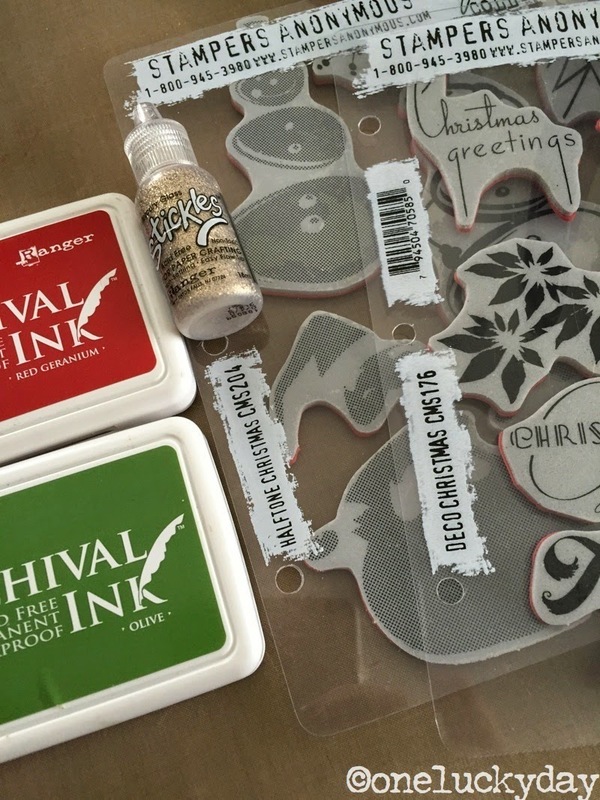 I like that even though it is a smaller #5 tag (great for small gift or gift bags) and the wreath stamp is large, it can still be used. The little sentiments that come with the Styled Woodlands Set are different from any other set and super cute. Loved the filled in O.
I did add a bit more Stickles glitter on the berries. Another simple one - The Holiday Knits set is a standout this season! Since I was on a roll with the stamping - my niece needed an invitation for a party she is giving. I created the invitation and printed them out on cardstock. I used an old favorite, Christmas Time set, for the poinsettias and the stars. The bow is from Styled Woodlands. We inked them and used the Spritzer again. Super easy way to make standard cardstock look great! And of course we had to decorate the envelopes too! 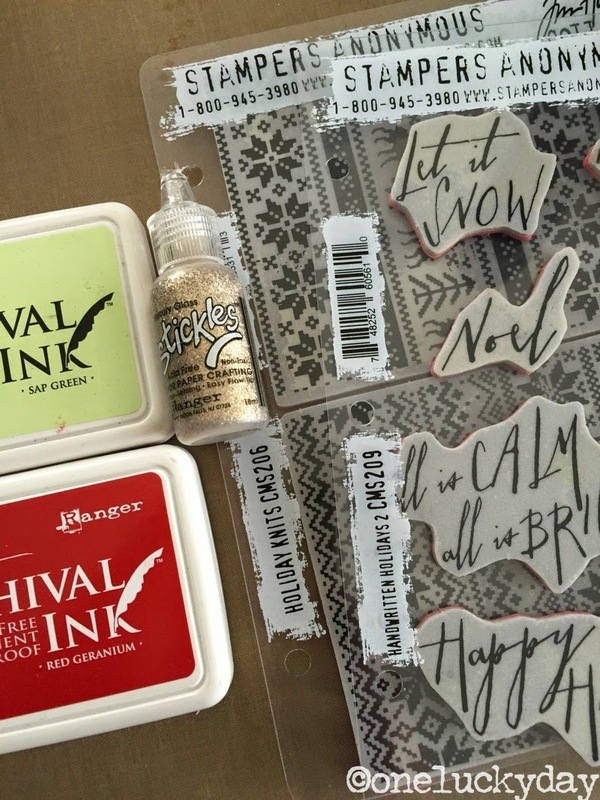 One more thing, if you cannot make it to Whim So Doodle this next weekend for the last set of classes for the year, I have posted a few of the 2014 Christmas kits in my Etsy shop. Just click on link here or use the ETSY logo in the sidebar - both will take you there. It's quite cute and very nicely packaged - like a gift in a box! Now I HAVE TO HAVE the Halftone stamp set! See you Friday! And Saturday! I've never heard of halftone stamps...where have I been all this time?? 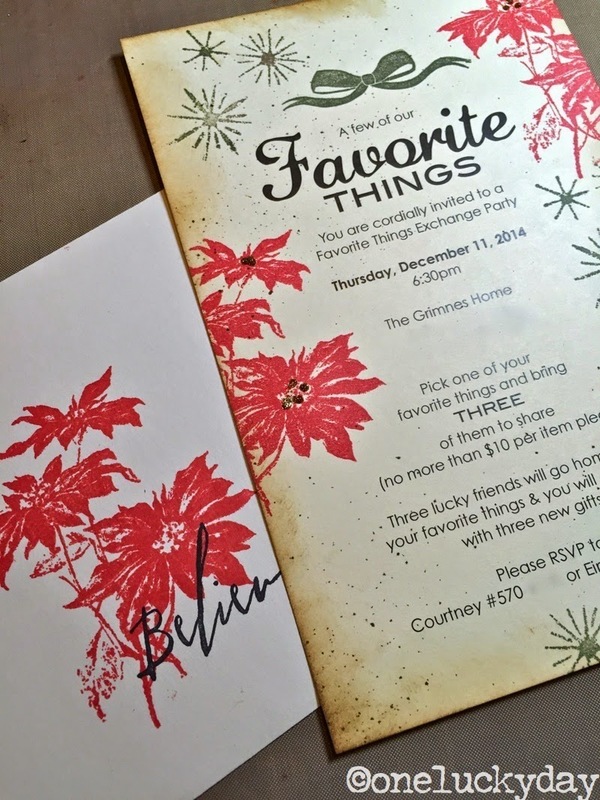 I adore the invitation - so festive! well I have had them and had not used them so I am just as bad. They really come out cute. Everyone at the stamping party loved the retro look. Love them all. I am definitely going to try that Olive, Plum and Rose Madder combo..so pretty! That Snowman is the bees knees. It looks perfectly retro. 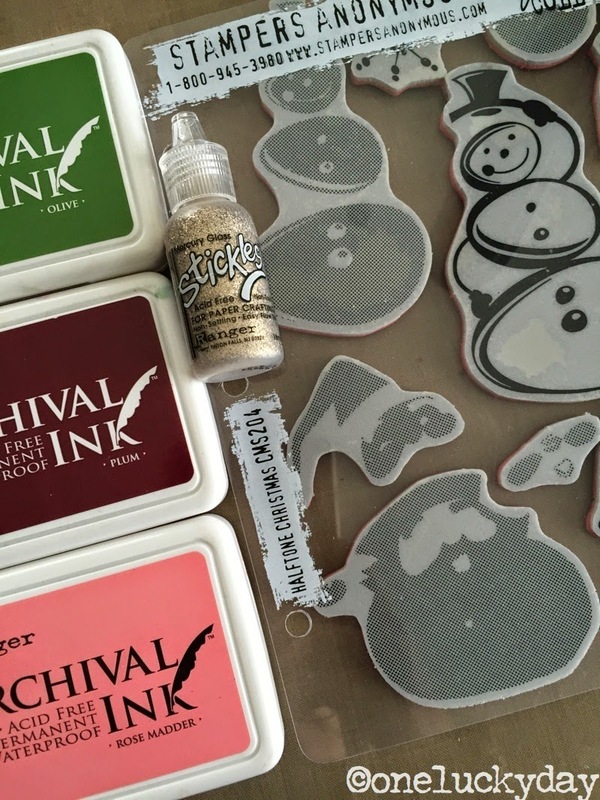 I just love the double stamp snowman set. I so want to own a set. Love the tags, giving me some ideas :) Thank you for always sharing. Fun! Loving the vintage vibe. Thanks for all the details. Oh what fun! Love them all! These are wonderful. I would love to put this on my blog and link back to you. Let me know if I may. thanks for asking Carol - yes you can use on your blog. 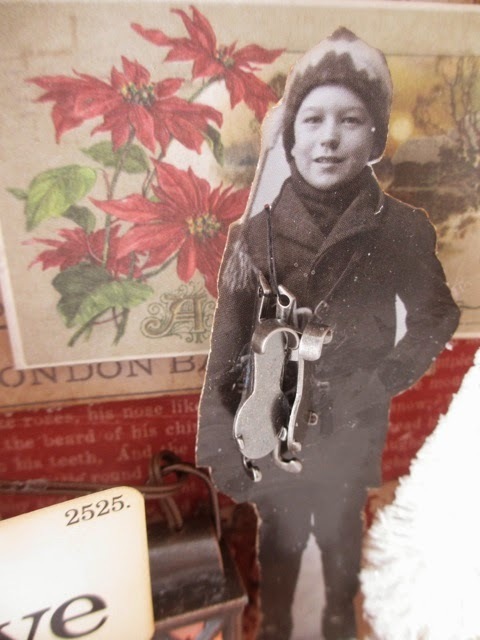 Love your fun vintage tags, especially the quirky words and tree one. The invitations are beautiful! Vintage Retro Christmas!!!! I can see how these would be addicting! LOVE them...and your color choices! These tags are beautiful, I always love your step by step tutorials!!! And bravo on the invites, what a way to dress them up!